The Josephson effect is a term which is used for the flow of a supercurrent between two electrodes of superconducting material, across a non-superconducting gap. 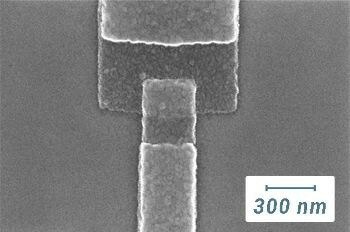 This is the Josephson junction and is responsible for the eponymous effect. It is valuable for research that makes use of quantum control to study and innovate in quantum computing, and to design new sensors, as well as into the principles of fundamental physics. Josephson junctions are at the very center of the attention-grabbing superconducting qubit, which is among the top contenders for the achievement of quantum computing that tolerates faults. The importance of this device is its non-linear inductance, which makes its spectrum of energy levels non-harmonious. On this basis, quantum mechanical relationships form (1 or 0) between different energy levels, which is the key to the creation of a qubit, or quantum bit. Another important area of utility of Josephson junctions is the detection of minute magnetic fields, which could be 1016 times as small as that created by a refrigerator magnet. These detectors are superconducting quantum interference devices, or SQUIDS, and are vital to many areas of research such as identifying nervous cell activity within the brain, characterizing different materials and designing revolutionary ultra-low field MRI scanners. Josephson circuits require an environment without any contamination whatever, for which reason two chambers sealed away from each other are used, with evaporation occurring in the first and oxidization in the second. The second chamber is perfectly secured from the deposition chamber by load locks as well as automated processes which are operated by programmable software, using recipes, contained in Aeres, the sophisticated software for process control from Angstrom. The two chambers are made of stainless steel which has been electropolished, and this ensures that off gassing is minimal. The materials are transferred in situ between the chambers to reduce venting to the minimum. Critical current density is the single parameter of a Josephson junction that requires strict control in some applications. This is affected by the thickness of the layer of insulating oxide that separates the two layers of aluminum, because it must be kept as minimal as possible. 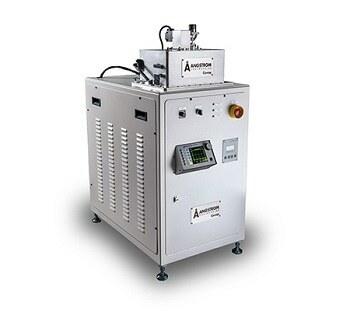 The process of controlling the film oxidation is therefore crucial, but this has been optimized with the mass flow controller, a tool from Angstrom, which is capable of being regulated by the user using the company’s proprietary process control software called Aeres. 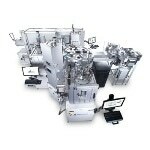 This makes sure the film is oxidized to the exact thickness required with extreme repeatability. When aluminum needs to be evaporated for a superconducting circuit, an electron source is the best option due to its great versatility. This permits more material to be handled, without having to provide a chamber vent, and this means the films are clean and uncontaminated. In addition, the electron beam evaporation creates a flow of vapor that allows the creation of fine patterns required by Josephson circuits. 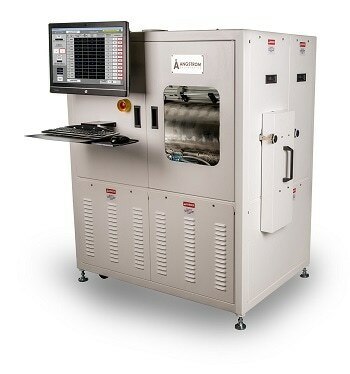 An ion source is used to prepare the surface of the substrate before deposition of the film begins, as when a surface cleaning is needed, or precision etching. Josephson junctions are sometimes created using materials such as niobium, which need magnetron sputtering, and in such a situation a source of magnetron sputtering can be joined to the system which deposits the thin film in a smooth manner. 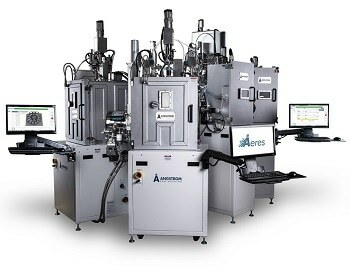 Josephson systems can be created to enable the use of multiple chambers which are linked, for more than one method of deposition and for analytical platforms, joined to make one single automated process. 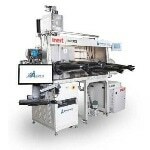 As a result, each system can be configured differently whether it is a dual chamber system with deposition and load lock features, or an in-line system. This embraces the use of robotic arrays of radial clusters, made up of different points at which deposition, oxidation and analysis occur. To form a Josephson junction, it is necessary to create a carefully angled substrate with respect to the plume of deposition. As shown below, one way is using a variable angle stage. Angstrom presents a variable angle stage which surpasses 0.1 o angular repeatability. The stage can be refined to include both heating and cooling of the substrate. 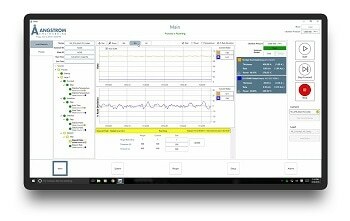 All the inputs such as the angle, the rotation of the stage and the temperature of the stage are controllable with user-based recipes input through the Aeres software. All that the user needs to do is to enter the right values and press the start button, following which the machine will take over to create a complete Josephson junction without any operator intervention. One or more load locks to facilitate isolated oxidization; a chamber where deposition occurs; a variable angle stage; and a source of electron beam or sputter, as the need may be. 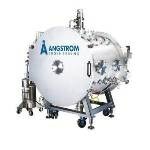 All of this comes with Angstrom’s long and varied experience with thin film deposition and service support. Josephson junctions need precise control of each variable to be created successfully. This is why each step is controlled via Angstrom’s sophisticated process control software called Aeres. This can be used to input the right variables, create the desired recipe, edit it as required, and leave the machine to work, confident that the recipe will be followed exactly, with great accuracy and repeatability. The proprietary algorithm for Auto Tune PID detection enables completely automated calculation and use of each process control variable, with respect to the material chosen, the rate of deposition, the pressure, and the stability necessary for the desired evaporation to occur. The angle of the stage, the rotation and temperature values are set for accurate repeatability. The system allows rapid pump downs, accurate measurements of the pressure, and fully regulated flow of oxygen gas to produce oxidization when required. 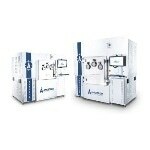 The recipe just needs to be loaded with the required values and the actual processing is then controlled by Aeres. The whole process of creating a Josephson junction is controlled with the utmost precision, executed with accuracy and repeatability, and all the documentation completed to enable later review.